If you’re thinking about proposing, congratulations! This is an exciting time in your life. But chances are, you’re already worrying about taking the first step: buying an engagement ring. Relax! While this may seem like a daunting task, it doesn’t have to be. By following these six easy steps, you can buy an engagement ring that she’s sure to love and cherish for a lifetime. An engagement ring is a symbol of your love and commitment to your future wife. Engagement rings are worn on the fourth finger of the left hand because it was once believed that the vein in this finger ran straight to the heart. You want to choose a ring that will remind her of that day for the rest of your lives together, so it’s important that you choose a ring that represents your love. Before you even set foot in a jewelry store, it’s important to decide how much you want to spend on your engagement ring. You should look at your ring as a long-term investment, especially compared to your other wedding expenses. The general rule of thumb for an engagement ring budget is two months’ salary (three if you include the wedding band), with at least 20% of that going to the setting. But keep in mind that many couples ultimately spend more than they originally budget. You should also prioritize your spending – is it more important to her to have a big diamond of lower quality or a small diamond of high quality? Would she prefer to have a number of smaller diamonds flanking the center stone or a single, larger stone in the center? Don’t forget to factor in the cost of the metal of the ring. This is one of the most important and least talked about aspects of an engagement ring; it will really determine not only the style of the ring, but also how it stands the test of time. The advantage to spending a little more on the setting is the assurance that your diamond will be held in place securely. Step 2: Find Her Ring Size If you don’t already know your bride-to-be’s ring size, don’t worry! There are a number of ways to figure it out without letting her know that you’re engagement ring shopping. If she removes the rings that she already owns and you can “borrow” one without her noticing, you should take it into a jeweler to find out her size. However, if this is not a possibility, you can try putting her ring on and marking where it sits on your finger or just trace the inside of the ring on a piece of paper. A jeweler can ascertain her size using this information. You might prefer to take a more direct route: asking. Casually bring up rings or ring sizes in conversation and ask her what hers is. Or consult with her best friend, sister, or mom – your bride-to-be may have told them her size in preparation for the day that you would want to know. After you have the logistics down, it’s important to educate yourself on diamonds. The three most important things to learn about are the different diamond shapes, the 4Cs, and diamond grading reports. The basics of what you should know are below. Popular shapes Round – This is the most traditional cut: in fact, more than 75% of all diamonds sold are round. Princess – Princess-cut diamonds are a relatively recent invention; they are cut in the shape of a square and have elaborate faceting to give them extra sparkle. Cushion – Cushion-cut diamonds are rectangular with rounded edges and have a vintage appeal. Emerald – An emerald-cut diamond has a rectangular shape. It is a rare cut, but it has recently been gaining in popularity. Pear – Pear-shaped diamonds have a tear-drop-like shape and can make shorter fingers appear long. Oval – Oval-cut diamonds can also flatter short fingers and are ideal for brides who want something round but unique. Marquis – Marquis diamonds are shaped like ovals with pointed ends, which can make them appear larger than they actually are. The 4Cs The 4Cs were established by GIA, whose mission is to ensure the public trust in jewelry. They are the industry standard for evaluating diamond quality. Cut – refers to a diamond’s proportions, symmetry, and polish. Color – graded from colorless to light yellow. The less color a diamond has, the higher its value is. Clarity – describes the number of inclusions in a diamond. While almost all diamonds have inclusions, many are not visible to the naked eye. Carat – measures the weight of a diamond. 1 Carat weighs about .2 grams. The value of every diamond is determined using the 4Cs, but only a gemology expert in a fully equipped lab can truly evaluate how any given diamond rates on each quality. A diamond being touted as a special grade or any diamond over .5 carat should be accompanied by a grading certificate from a recognized, impartial lab. The setting refers to not just the band, but also the mechanism that holds a diamond in place. When selecting yours, remember that the metal matters! Different metals have different qualities that affect their long-term wear and appearance. While men may be interested in the rarity of the setting metal, it’s important to keep in mind that women are concerned with the durability and longevity of the ring for good reason–they want something that they don’t need to worry about and that’s going to last. 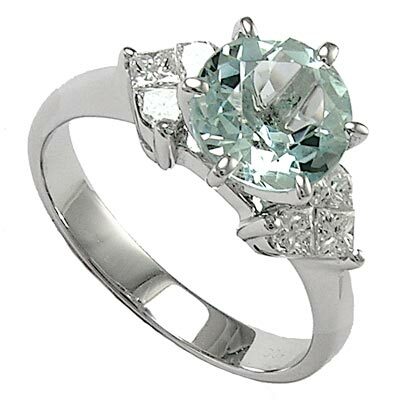 Your first decision in choosing a setting is whether she would prefer a white or yellow metal. A white metal setting will best complement a diamond, but you should look at her other jewelry to figure out her preference. If it is primarily yellow gold, your choice will be between 14K and 18K. However, today most women prefer white metals. In fact, in a recent survey by Modern Bride / The Conde Nast Bridal Group, 81% of women polled said that they would like a platinum engagement ring. The two most popular white metal choices for engagement ring settings are platinum and white gold. Keep in mind that platinum is naturally white, so, unlike white gold which is really gold that’s plated with rhodium to appear white, platinum will never need to be re-plated to maintain its color. Also, platinum is more durable than white gold, meaning your prongs will not wear down and they will always hold the diamond securely. All metals will scratch with wear, but another advantage of a platinum ring is that scratches on a platinum ring displace, but do not remove, the metal. It can be moved back into place by a jeweler, and many jewelers will polish rings for free as part of their service plan. Once you have chosen the metal, you will have to consider the style of the setting. There are many different setting types, but the most popular are bezel, prong, channel, 3-stone, and solitaire. In prong settings, platinum is the most durable metal and holds the diamond most securely, which is why most of the world’s most valuable and famous stones (like the Hope Diamond) are set in platinum. Because the setting has a great impact on the style of the ring, you will want to choose one that is consistent with her style. Does she like streamlined modern designs, simple feminine styles, or dramatic pieces? If you have an idea of what her personal style is, it should be easy to find a setting that suits her. And if you’re lost when it comes to style, don’t hesitate to ask for advice. Doing your homework before your first in-store shopping experience will make you feel knowledgeable and prepared. This article is a basic guide, but there are many other helpful online resources: preciousplatinum.com is a great place to start learning about the engagement ring. It’s also a good idea to talk with people you know who have experience before you shop. This includes her family and friends. Her mother or sisters may be able to help you figure out what she wants if you’re hoping to surprise her. You may want to consider buying your ring in a set. Many jewelers offer two- or three-ring sets that include wedding bands with the engagement ring. Remember that depending where you go the prices of most engagement rings are negotiable (although not by much). When telling a salesperson your budget, underestimate. They will probably show you a few rings that are a little outside the budget that you tell them. Be sure to ask about their return policy, service plans, warranties, certifications, and upgrade options! Step 6: Buy with Confidence!